Following the impressive recovery in 1999, the economic performance of the ESCAP region strengthened in 2000 in an environment of low inflation. The developing economies of the region increased GDP growth form 6.1 percent in 1999 to 7.2 per cent in 2000, with the majority of them exceeding 1999 growth rates. Growth was generally driven by buoyant world trade, declining domestic interest rates and continuing fiscal stimuli. Prospects for 2001 are mixed. A sharp slowdown in the Unites States and a weaker than expected recovery in Japan could dampen export growth. High and volatile oil prices might be another inhibiting factor. However, continuing growth in the European Union and strong intraregional trade could partially offset such adverse effects. 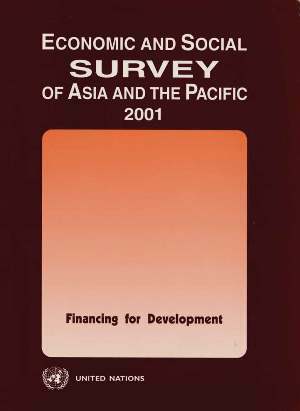 A moderate deceleration of growth of around 1 percentage point, accompanied by a slight pickup in inflation, is likely to occur in 2001.
Financing investment for development poses a formidable challenge for many developing countries because of declining official development assistance, a high concentration and/or volatility of private external resources and difficulties in raising domestic savings. For countries to achieve greater success in raising finance for development, their governments must, inter alia, implement a consistent and prudent set of macroeconomic policies, enhance transparency of the budgetary process, develop wider and deeper financial markets, improve the management of domestic and foreign debt and apply international norms and standards in the governance of the corporate and financial sectors. Domestic policy initiatives must be complemented by supportive international action. The international financial architecture should be reformed to reduce periodic bouts of instability; measures should be adopted to widen access to foreign direct investment; and the flow of official development assistance on improved terms must increase, particularly for the least developed, landlocked and island developing countries and the economies in transition.